The first of two alarms sounds at 5:50 GMT, like every morning, Mondays to Fridays. It shakes me from dreams that I never remember. Still sleepy I stretch my arms, which were folded through the night, and automatically I poke them through the two slots on either side of the sleeping bag to allow the arms out. In space, every move starts a chain reaction so my sleeping bag is tied with four thin cords to the wall of the crew quarters or else it would float away. My head often gently touches the ‘ceiling’ causing my body to bounce slowly in the opposite direction until the my foot touches the floor briefly. Now that my hands are free I remove my eye mask that keeps light away and open the zip that holds me in my sleeping bag . Inside the crew quarters everything is dark except for the dim green and blue led lights from two computers and their connection to the Space Station network. Everything is silent until I remove my ear plugs and the familiar hum of the fan that circulates air returns. My first automatic action is to activate the computer to read the daily crew conference that Houston sends at night. This report contains the latest information on the day’s operations, any schedule changes, questions, and answers to questions we raised the day before. It also contains fundamental information in case of emergency and I send it to the printer to have it available later. I also print a list of people with whom I will talk today in Houston and Huntsville (USA), Munich (Germany), Tsukuba (Japan) and the ‘Tsup’ in Moscow (Russia) . Although we can always use call signs, it is more friendly to call people by their name from time to time. Many of the people I talk to on Earth are instructors , colleagues and friends . I put on a pair of sport shorts and a cotton shirt. Opening my sleeping quarter’s door I find myself oriented sideways. Habituated from experience I pull myself out and push myself towards the Destiny Lab in a single movement. 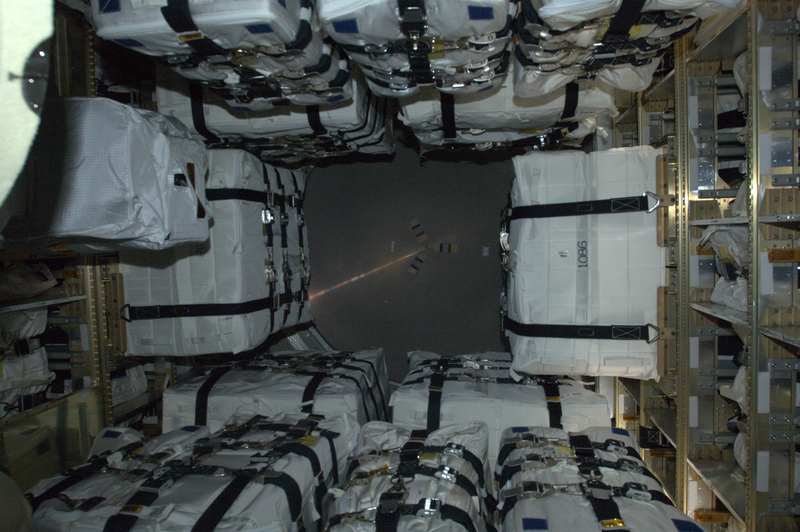 The Destiny module is still dark even though I know that Mike has been awake for a while. I fetch the first page of the daily summary as I pass the printer and place it above the others near the computer, that interfaces with Station systems that we would use in an emergency . It’s time to prepare breakfast: oatmeal with cinnamon and raisins and coffee, both rehydrated with water. While I eat I read the yesterday’s news in an electronic version of an Italian newspaper. I had was aware of some of the news already by internet, but I like to read the commentary of prominent journalists. There is still an hour to go before the official start of the day, which starts with the first of two Daily Planning Conferences. I decide to start preparing the first of the daily tasks, an experiment called BP Reg. Normally I would follow Mike and exercise in the morning, but this experiment provides very accurate measurements of blood pressure, so I am not allowed to do any sports in the hours that precede. 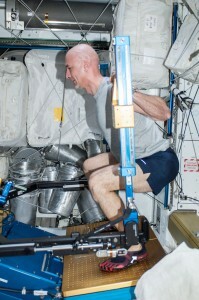 I move to the Columbus laboratory and use one of the computers to read the experiment procedure. I start collecting the materials and assemble the tools that I will use in the coming hours. 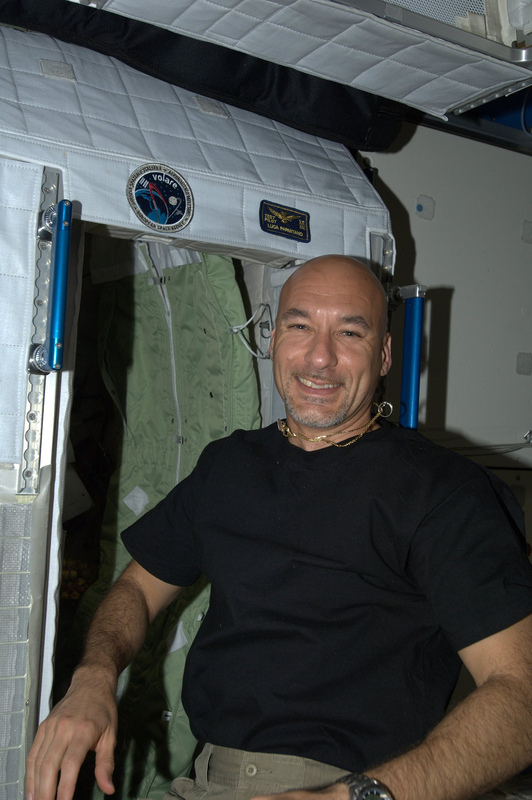 Right on schedule, Fyodor begins the Daily Planning Conference with Houston, Huntsville, Munich, Tsukuba and Moscow: “Good morning from Expedition 36. We are ready for the DPC.” In turn, the control centres update us on the day that is about to begin. In the meantime we turn on the cameras and we welcome them onboard. 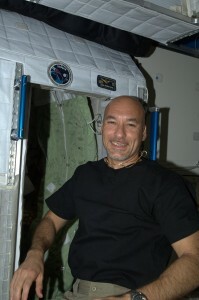 I continue to prepare the experiment in the Columbus lab by initializing a computer and connecting the last components. 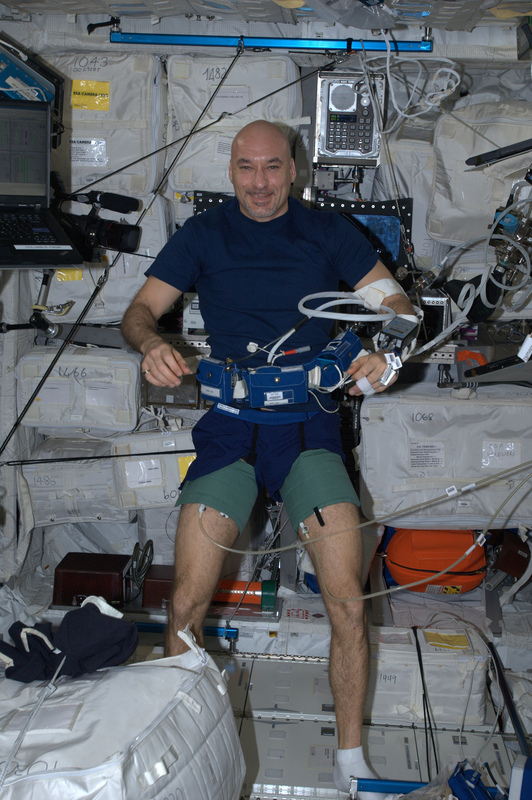 Under Huntsville’s supervision who follow my actions from camera 2 in Columbus, I wear two bands over my thighs that inflate and reduce the blood flow to the lower part of my body. Three minutes later the bands instantly deflate and my cardiovascular system reacts sharply to compensate for the unexpected increase in blood flow . Two pressure sensors on my left hand record any changes to compare the data with measurements made on ground. 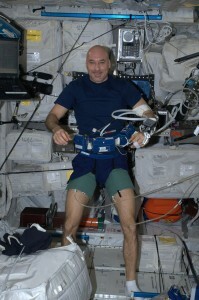 The experiment reproduces the pressure variation felt when standing up suddenly after being seated. 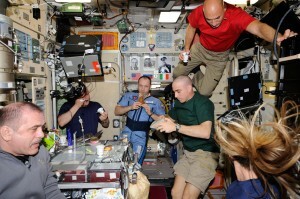 The idea is to measure the effect of microgravity on a human being’s cardiovascular system. The experiment continues. As I speak with the PayCom on channel 2, I hear Mike speaking on channel 3 who is busy with another experiment called CFE in Node2. Karen is busy with Spheres and is working in Kibo: from time to time I hear her comments on channel 2 as well. After about two hours of the experiment comes to an end , but I will have to wait for my return to Earth to have the results. The study will continue well beyond my mission. I finish in time to return the equipment to their compartments around the Station . It is already time for lunch and I am hungry, but I cannot eat too much because the first hours of the afternoon will be dedicated to exercise and, even in orbit the same rule applies: better not to do conduct brisk activity after a ‘heavy’ meal. I settle for two small tortillas, wrapped around some tuna fish, salmon and some vegetables . I decide to start my exercise with ARED: today’s exercise consists of three sets of weight-lifting exercises involving all major muscle groups. As soon as I lift the bar on my shoulders, I feel my back muscles work and my legs stiffen with tension. 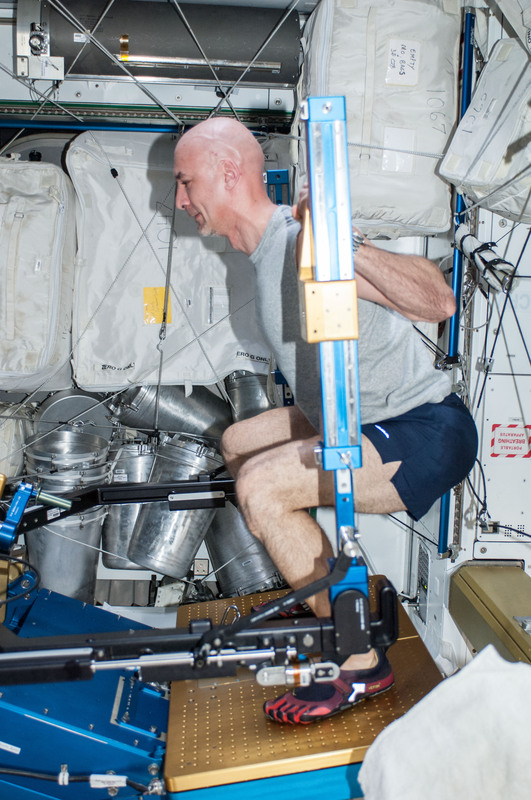 It has been five months I have been in space and my body has fully adapted to microgravity: my muscles feel abused even during this light warming-up as they spend around 22 hours a day in a relaxed state. ARED is located directly above Cupola: a window to the world fills my view while I struggle with my weightlifting , and I forget the aches and pains as I get lost in the details that pass ‘above’ me ( ARED is upside-down compared to the normal orientation of the Station). I see the coast of Tierra del Fuego in Argentina, with snow that blends into clouds and the South Americans fjords that look like fingers. I see the intense blue of high-altitude lakes, the ancient volcanoes that spread black lava scarring their surroundings for hundreds of kilometres. Within a few seconds we overlook the more temperate areas of Argentina, the Pampas soon turn into the plantations of Brazil, which in turn become rainforest once we reach the Amazon delta. Earth is a kaleidoscopic, never-ending carousel of lands followed by oceans, a string of contrasts and colours that always change. With this spectacle you easily forget you are tired. After an hour and a half of ARED I prepare for T2, our treadmill. 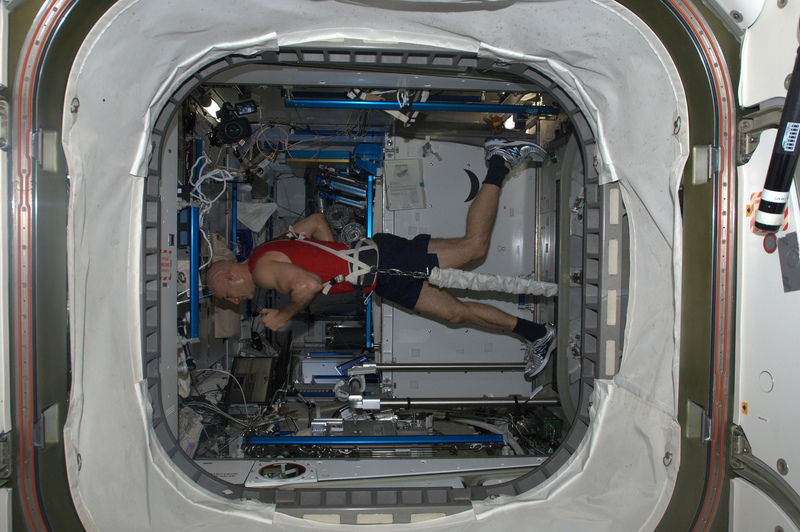 I wear a harness connected by two elastic bands to the platform: I can control the amount of body weight that my muscles will endure during my training by changing the length of these bands. The last week I have been setting the bands between 95 and 100% of my weight because I want to readjust to gravity for my return to Earth. I pay the price for my choice in the amount I sweat. The next 30 minutes my body will feel more dense than I am used to. It is like running with someone pressing down hard with their hands on your shoulders, constantly pushing you to the ground. The next job of the day is in the Russian part of the International Space Station, in the Automated Transfer Vehicle. In a few days we will close the hatch for the last time and ATV Albert Einstein will leave us to disintegrate as it enters Earth’s atmosphere. The last act its voyage is to free the Station of waste that accumulated over the past five months. ATV takes both solid and liquid waste, organic and inorganic. My job today is to organise this waste by applying a careful choreography opposite to the procedures Chris, Karen and I ran months ago when we unloaded the ship’s precious cargo. When I enter, Albert Einstein is dimly lit and quiet, it seems as though it is half dozing ,waiting for me. I like to work alone in ATV, I enjoy the large space that I can move freely in as I rearrange the various containers. Mike joins me shortly after I start and we complete the work assigned to us for today. We have just enough time to get back as Fyodor’s familiar voice begins the second Daily Planning Conference: the evening conference. As I listen to the control centres I prepare dinner: walnuts, grilled chicken breast, vegetables and fruit. Once the conference has finished, I take advantage of a Ku-band satellite connection to make some calls. Like every night I call my parents. I have spoken to them more often in the last five months than in the three years spent training around the world before my mission. We do not have much time before the connection drops but it does not matter how long we talk for – nor is it very important what we talk about – the communication link allows me to create a serene image in my mind of my father and my mother listening to me from Earth. Dinner is eaten quickly because tonight we are just three at the dinner table– all six of us only have dinner together a couple of times a week because it inevitably turns into a late night! We split up for the little free time we have left. It is only 20:00 but fatigue will catch up with me and I still have e-mails to answer, social media to see to and photographs to catalogue, send and publish. Time is passing fast as I listen to some music. I divide my attention between two computers to try to do everything at once. I dedicate the last moment of the evening to my wife before switching off the light and climb into my sleeping bag. The five -hour time difference between my wife and I separate us more than the thousands of kilometres of emptiness: she is in the middle of her daily activities while I am getting ready to sleep. Kathy, with her typically female infinite patience, puts everything aside when I phone – the problems of everyday life that every mother and every wife encounters. She grants me a few minutes of serenity, a moment that seems to stop time, a little gem of priceless calm, a break from the world, made of the stuff that dreams are made of – but this memory, at least , will stay with me upon awakening.